The Supervision Program is a support program designed to achieve two main goals – improve the quality of officials, identify skilled officials throughout the province, and ensure a uniform application of the rules. Good supervisions are positive and honest, and they rate officials relative to the level of hockey they are working. Know the Rules and Procedures: You need to be a source of this information. Reinforce class room instruction in real games. Communicate: Good open communication is the key to a good supervision. Be a good listener. Be empathetic. Problem Solve: Identify problems and provide solutions. Provide a couple of areas to work on. Provide positive reinforcement. Evaluate: The supervisions are used to determine the level of the official’s skill development. Good communication on the ice before, during and after game. Rapport and communication with linesman, players and coaches. Does he have the respect of the players and coaches? End-zone positioning. Use of home base, half-piston and at the net positions. Positioning following the play out of the zone and into the zone. Is the penalty procedure correct? Stop after blowing whistle, pause, then point to player and give signal. Does he skate backwards towards the penalty box to keep an eye on players and avoid contact with penalized player? Positioning at the blue line to make to close call. 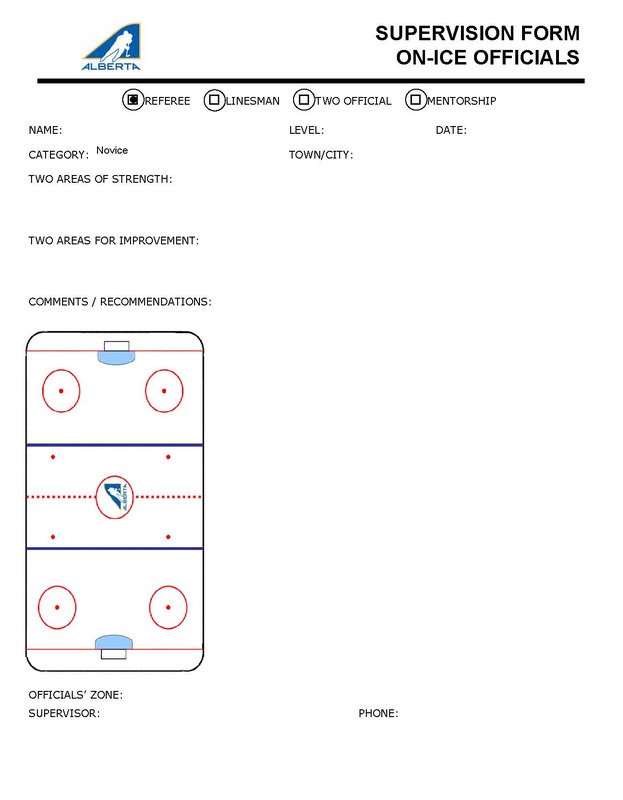 Positioning as the back linesman in the neutral zone to be able to move with play as it changes zones or stops in his partner’s zone and to be able to call offside passes. - Are centers and the wingers in front lined up correctly? - Have the wingers behind been checked to ensure that they are not encroaching? - Does the back linesman watch the wingers behind his partner to ensure they are not moving or entering the face-off circle before the puck is dropped? Judgment and consistency with regards to penalty selection. Does the referee stay focused and concentrate for the complete game or are there times when it was apparent that his concentration lapsed? Reaction to pressure – fans, coaches, players complaining about calls made or not made. Is the referee able to concentrate through all the noise and distraction? - Are centres and the wingers in front lined up correctly? - Are both linesmen ejecting the centers from the face-off if an encroachment violation occurs when it is their responsibility? - Is the puck drop consistent and fair to both centers? - Do the linesmen exit the zone after a face-off quickly, backing towards the blueline to watch play and avoid players or the puck? When covering for the referee, are the linesmen moving to the proper position for a play at the net? - If a goal is scored, are the linesmen pointing at the net without blowing the whistle? - Are the linesmen releasing to their blue line with the referee gaining correct position? Are proper procedures being followed? - Check nets before the game starts. - Awareness/communication after whistles, during fights. - Repairing holes in ice. - Picking up broken sticks, lost equipment. Honesty is the best policy. Always be honest in your comments; do not tell the officials one thing and then report something different. Always be objective in your comments. If there is something critical to report, then offer a method or solution with which the official may correct or improve. Be a good listener. It is important that you be attentive to what an official is saying to ensure that there is no misunderstanding of your comments. Be sympathetic, especially when dealing with inexperienced officials. Remember, you were once a “rookie” yourself. When talking to the referee, it is usually acceptable to have the linesmen listen in, as this can be a learning opportunity for them as well. If the discussion may be very critical, you may want to discuss these issues only with the referee. Talk to both linesmen in the presence of the referee. This encourages teamwork, and provides the opportunity for input from all officials. Talk to both officials at the same time if the game was officiated using the two-official system. Never be openly critical of game officials or the association that you represent. Hockey fans and players are quick to believe the negative instead of the positive things about a referee or linesman. Make your report and comments private. Your report is confidential and must be treated as such. Be beyond reproach at all times in your actions and comments. Remember, good communication is the lifeline between officials and the supervisor. Unreceptive/Defensive: May be unintentional. Identify the problem as to why the official is defensive. Reassure them that the feedback you are giving is not personal. Unreceptive/Not Responsive: Start to ask open-ended questions. Help to reduce nervousness by putting the official at ease. “I didn’t see it...” or “I can’t remember it”: This may be the case on certain occasions, however not for all scenarios. In a retaliation situation why wasn’t someone watching? Remind the official you are there to help. This may stop the defensive actions and may open the dialogue. Playing one supervisor against another or appeals to a higher authority: Challenge this point – get to the bottom of it. Write the situation down in front of them, let them know you will do some follow-up, and then get back to the official. Third Party Interference: If possible ask the third party to excuse themselves until the supervision is complete. “The coach was happy...”: Who is the boss? Call the bluff. Was the coach happy because you were not fair? What about the referee in the next game that calls it the way it should be called?